The Outdoor Swimming Pool reopens for the Summer Season Saturday, May 27, 2017 over Memorial Day weekend. It will remain open through Labor Day 2017. Beginning in the summer of 2017, pool access will be through resident FOBs. 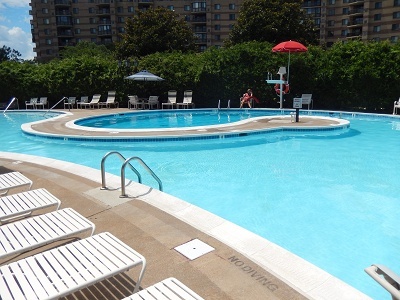 Each resident who wants access should bring their FOB to the Front Desk to have it activated for the pools. The Men's and Women's Spas, completely renovated in 2016 and located in the lower level of the Community Center, remain open year-round.